The effects of Parkinson's disease can creep up on us. Exercise has been shown to fend off Parkinson's disease symptoms—it's "like medicine," as one neurologist says. Make exercise part of your daily routine. 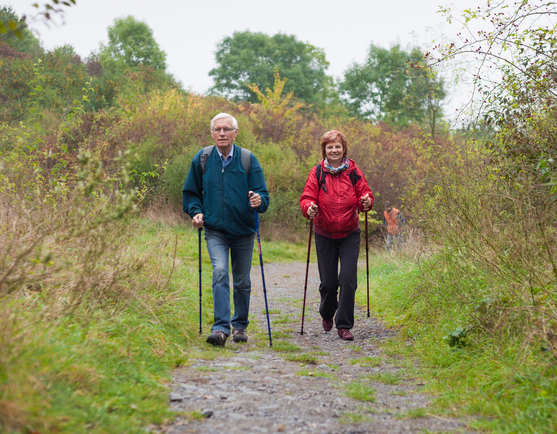 For those at risk for Parkinson's disease, consistent physical activity can delay the symptoms. About 60,000 people are diagnosed with Parkinson’s disease (PD) each year; most are over age 60, and men are twice as likely to have it as women. 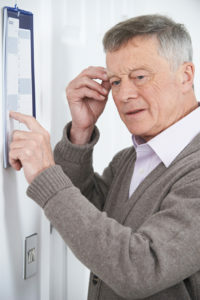 Early Parkinson’s disease symptoms are subtle, occur gradually, and may go unnoticed for some time. As the disease progresses, however, the shaking, or tremor, that affects the majority of people with PD, may begin to interfere with daily activities. Patients may also experience other symptoms, such as sleep issues, depression, and cognitive decline. To combat those symptoms, neurologists–specialists in treating Parkinson’s disease–are increasingly prescribing exercise as part of their recommended treatment plan. Researchers from the National Parkinson’s Foundation (NPF) looked at data on more than 1,300 of the study participants who reported little regular exercise at the beginning of the study. Five hundred of those individuals began exercising more than 2.5 hours per week within the next two years. The researchers compared participants who exercised regularly for the entire two years to people who didn’t exercise at the beginning of the study, but then started to exercise regularly. Over the two-year study period, quality of life scores worsened 1.4 points in the early starters and 3.2 points in the late starters. The study didn’t separate types of exercises, just the total exercise reported. Trying different options can keep exercise interesting for body, mind, and spirit. “Pedaling for Parkinson’s,” for example, is a stationary spin bike class offered at many YMCAs and other centers nationwide. This established program works similarly to a conventional spin class with upbeat music and a motivating instructor. Dancing, especially with a partner, can also be helpful to those with PD. In addition to learning steps, the social aspect of partner dancing can be uplifting. The point: It doesn’t matter what exercise you do for holding off Parkinson’s disease symptoms—and, for that matter, to improve your health in general. What matters is that you enjoy it. 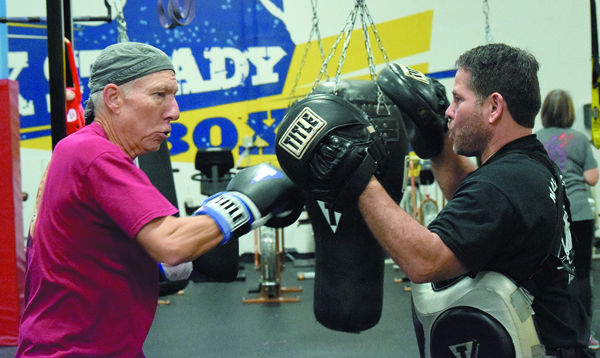 Rock Steady Boxing is a program designed for those who deal with Parkinson’s disease symptoms. It started in 2006 with six people in a borrowed gym in Indianapolis. It has since expanded into nearly 300 programs in 44 states as well as several international locations. 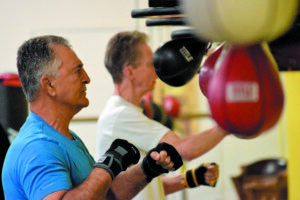 Participants don’t box each other; rather, they do boxing drills, including work with heavy bags and speed bags to improve such skills as agility, speed, coordination, and endurance. Classes may be segmented according to functional ability, or they may be mixed level. They also include lots of stretching as well as exercises that focus on core strength and fine and gross motor skills. To find a class, go to RockSteadyBoxing.org. cognitive decline, core strength, dance, depression, endurance, exercise, health, music, parkinson s disease, sleep, sleep issues, strength. I am 56 years of age and was quickly diagnosed with Parkinson’s 11 months ago. My symptoms are shakiness (increasing) and general reduction of control and strength of the left hand. I experienced a general tightness of the chest accompanied by periodic sudden feelings of shortness of breath. I also become quite dizzy when performing any athletic function (jogging). I was quite active . I was on Levodopa/Carbidopa, 100/25.i spent a lot of money on medication,so i decided search for permanent cure. Why don’t you tell Michael J Fox? if It REALLY Works he will endorse it! Selling Herbs on UHN now? need help for a friend 38 y/o with Parkinson’s! I was diagnosed with multiple sclerosis 1 month after I turned 45. My grandma is 96 and had it since she was in her 20s. I have been on Copaxone, the first year was daily and now I am on 40 mg, 3 times a week. It made a tremendous difference for me. Although the fatigue is what really gets to me. When I do too much, I do start to feel weak. My MS got significantly worse and unbearable Last year, a family friend told me about Organic Herbal clinic and their successful MS TREATMENT, I visited their website and ordered their MS Formula, i am happy to report the treatment effectively treated and reversed my Multiple Sclerosis(MS)), most of the symptoms stopped, I’m able to walk and eat well, sleep well and exercise regularly., I’m pretty active now and my attitude is extremely positive.